Software has many moving parts. Even a small open source project expects you to maintain the codebase, keep the documentation in sync, push snapshots and releases, update the changelog and maybe showcase a demo application. All of this is a distraction from your original scope: writing code that matters. A solution is to outsource as much as possible to continuous integrations services. When asked for a snapshot of my library I want to answer: "The last commit is always available as a snapshot". When a snapshot version looks good I want promote a release from my smartphone while on the move. The less commands I run from my laptop, the happier I am. 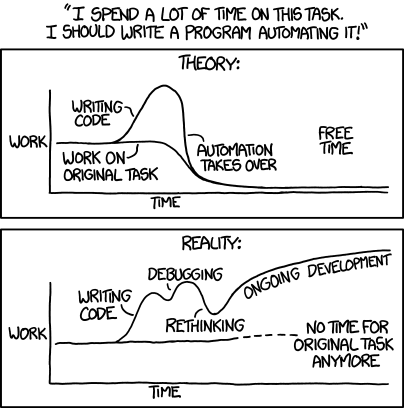 Automating requires a lot of trial and error, and there's always room for improvement. The following is my current setup using Leiningen and CircleCI. Hopefully it will give other devs an easy recipe to start automating their builds while avoiding the most common pitfalls. So point your browser at circleci.com and let's get started. It's very well documented and has a clean, simple approach to configuring your build environment. The UX needs a bit of love. As a comparison in Travis in each screen you have access to exactly the actions you need. Navigating through projects and settings is clean and effective. Circle can be confusing and cluttered at times. There's no way to remove or download the log files. That is very annoying if you -cough- accidentally leak sensitive information. You wil need to send a polite email to their customer service that potentially takes a lot of time to be actionable (at least for us on the European time zone). Pull request builds can be activated, but they do not hide secure environment variables. It would make more sense to me to enable pull request by default and add a switch to enable/disable secure variables for them. As they stand now they are unusable. A continuous integration server cannot perform many interesting tasks if it doesn't have the credentials to do so. CircleCI allows you to set up hidden environmental variables for each project. This way your scripts can access passwords, api tokens, email addresses and other sensible information. I found this approach really hard scale if you have over 4-5 projects: I like to change my credentials from time to time (and so should you) so keeping everything is sync is too much work. In a better world Circle would provide you a way to setup a configuration that you'd like to run for every machine. This configuration would be stored securely, never displayed in the logs, and only executed when you're the author of the commit. We don't live in that world yet, but we could achieve something pretty similar. Note the dot preprendend before running init.sh: this makes any variable you export inside your script globaly accessible. This repo contains the files init.sh, credentials.clj.gpg and secring.gpg. After setting up git, the init script imports the clojars credentials and the gpg key so the remote machine can perfom the same actions as my local machine. It is also adding the passphrase and the default identity to gpg.conf so Leiningen would not complain when it tries to sign things. This script is part of the circle.yml file that sits at the root of project and tells Circle how build it. You can execute any bash command but seriously, who wants to write build steps in bash? It's much more fun to use Clojure, of course. To do so we're gonna call a Leiningen tasks that performs our deploys after the tests are successfully completed. Here's the entire circle.yml that I use for every project. I know the cool kids are moving to boot (and with good reasons), but Leiningen remains strictly superior when it comes to deploy logic. I'm looking forward to see if this changes in the near future. Not everybody might that Leiningen can do a fairly good job as a scripting tool. If a .lein-classpath file is added at the root of your project and it contains the path to a folder, let's say build, then under build/leiningen/circle.clj you can write a custom circle task that performs any build logic. Here are some examples. Since gpg and clojars credentials are available on the CI machine, artefacts signing and deploy should work seamlessly. Github pages are a great way to host HTML documentation for your project. The output generated by the great codox plugin can be pushed to a gh-pages branch so it's readily available online (and versioned!). By no means perfect, this task still gets the job done by checking the remote branch in a temporary directory, adding the generated documentations to it, commit and push. And voilà, documentation is taken care of. We can reuse the same task to push a demo application (in my case under a directory called "sample") to a branch called "heroku". When the heroku branch gets built, the demo application will be sent to Heroku. Done! Congratulations, there's nothing for you left to do. You can look at the full configuration at pedestal-swagger. I've used the same strategy to build a cljx project (in linked), a multiproject with lein sub (in icepick) and a Cryogen static website (in frankiesardo.github.io). If you'd like to share or discuss ideas on how can we make our open source builds better, leave a comment or ping me on twitter @frankiesardo.